If you have land and are interested in alpacas, the best way to learn about them is keeping alpacas as pets. Alpacas need enough land to feed themselves. They need access to a shelter to protect them against the dominant winds and bad weather. Fencing will also protect them from predators. Breeders recommend having no more than 5 to 7 alpacas per acre. 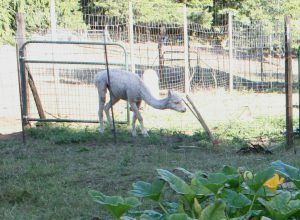 The land should be divided into smaller pens to serve as rotation to ensure alpacas always have green pasture. Animals need to have access to the three side or fully enclosed shelter. Every paddock needs to be connected to a path to it. Breeder also use these pathways as catch pens to herd the animals for shearing or any other care needed. The smaller the area, the easier the herding. Use 4 or 5 feet high woven wire fence with 2 x 4 inch rectangles. The purpose of fences is to create multiple pastures for rotation, setup a path to the shelter or shelters, prevent predators and other animals entering the paddocks and separate males from females and young animals. Every pasture will need a large water bucket for the animals. Alpacas are herd animals so when you buy them, you should get at least 3. When you want alpaca pets they should all be the same gender (all females or all males). We bought 3 females to start our heard and paid for stud services. When we sold our animals, we had 6 females and 2 males. Alpaca pets are often older animals or males that will not be used in a breeding program. They may or may not produce fine fiber. We call those males fiber boys. Their prices are much lower than the breeding stock. You can have medium quality fiber boys for $500 per individuals. Before you get involved, read books on alpacas. Amazon.ca is a great source of books on alpacas. 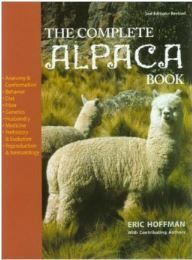 When we purchased our animals in 2006, we got “The Complete Alpaca Book”. I consider it the bible of alpacas. It covers every aspect of breeding. I highly recommend this book. Have a look at the different books and alpaca products on Amazon.ca. If you have any comments or questions, please write a comment to this blog. Nicole Champagne is a participant in the Amazon.com.ca, Inc. Associates Program, an affiliate advertising program designed to provide a means for sites to earn advertising fees by advertising and linking to Amazon.ca. Great article – thanks for the information. The only alpacas I’ve ever seen were pets kept on a small farm in Oregon, where we stayed in their bed and breakfast. They were interesting animals, but too far away for us to interact with them. What should people expect of pet alpacas? Do they develop relationships with people? What sort of interaction is likely between an alpaca and the pet owner? Alpacas are good pets but not like cats and dogs. People who keep them as pets usually have them to keep the grass short. Alpacas are very selective however. They will not eat everything like goats. Some plants are poisonous to them like rhododendron. One leaf will kill the animal. Alpacas are shy and will always keep a distance from any human. They do not like to be handled. The nice thing about them is their humming. They sound like they are gently signing all the time. Very different from sheep.